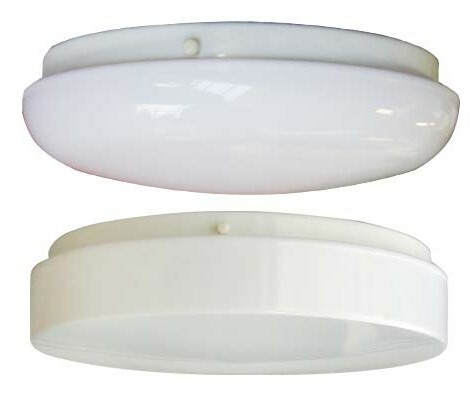 Contemporary energy-saving LEDs as well fluorescent, HID and incandescent fixtures designed for hallway applications and engineered with materials that offer a high resistance to rust, corrosion and impact. Wall Packs and graphic options are available. LED, Fluorescent, Metal Halide, High Pressure Sodium or Incandescent light sources. 120V, 277V, 347 (Canada). Housing in black, white or bronze. 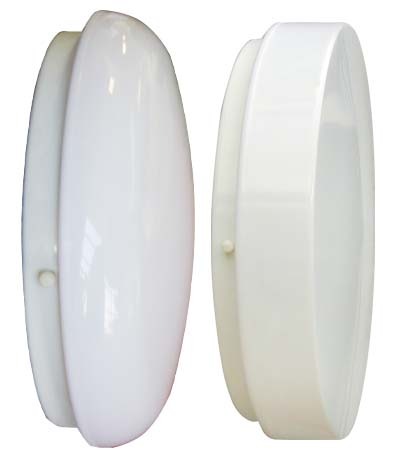 Lens in clear prismatic or opal white. Ceiling and Wall Models. Includes vertical and Wall Pack designs with lens masked in black, white or bronze high-temperature, weather-resistant paint; Graphics options of numbers, symbols, letters or custom logos or numbers and/or letters. ETL Listed for Wet Location (UL 1598). Lifetime warranty against breakage on polycarbonate lens andhousing. LED, Fluorescent, Metal Halide, High Pressure Sodium or Incandescent light sources. Housing in black, white or bronze polycarbonate. ETL Listed for Wet Locations. Lens in clear prismatic, opal white, red, amber, green, blue (law enforcement only) polycarbonate. 120V, 277V, 347V (Canada). LED, Fluorescent, Metal Halide, High Pressure Sodium or Incandescent light sources. 120V, 277V, 347 (Canada). HID: 9”(Square) x 8-13/16”(D)/12 lbs.